Maud Stack is a brilliant college student with an electrifying personality and the beauty to match. She is having an affair with Steve Brookman, an arrogant and self-serving English professor. Brookman has suddenly—conveniently—had a Road-to-Damascus moment. He must break off the illicit affair with Maud for the well being of his family, especially wife Ellie, who is having their second child and returning home from an extended trip. But Maud is a young woman whose passions are not easily dampened or caged, and Brookman’s infidelity quickly yields tragic and farreaching consequences that will reach beyond the elite college’s walls. After writing a scathing attack in the Gazette about what she sees as the narrow-mindedness of protesters outside an abortion clinic, Maud quickly comes under verbal fire from groups and individuals in and around the college kingdom. She is soon killed in a hit-and-run driver by what first appears to be a tragic accident. Neck broken, skull fractured and most of her ribs smashed to pieces, such was the violence of the impact. But was it an accident or something more sinister? Could this be payback in the extreme? One person has his own take on what happened and who’s responsible for Maud’s death: her father, retired New York police officer Eddie Stack. Eddie begins an unofficial investigation and quickly comes to the conclusion that Brookman murdered his daughter, or at the very least was somehow involved in her sudden and brutal death. If Eddie can’t bring Brookman to justice via the courts, then to hell with it, he’ll bring him to justice via the law of the streets. Unfortunately for Eddie, he is dying of emphysema and knows time is not on his side. He must act quickly despite the ticking clock and the old ghosts of past corruption coming back to haunt him. Death of the Black Haired Girl, like all good crime noir stories, has it all: love, hate, lust, betrayal, cover-ups, and revenge. It is also teeming with memorable characters: Jo Carr a former nun, now college counselor; Shell Magoffin, a would-be movie starlet as well as Maud’s roommate; and streetwise cop Lou Salmone, trying his best to put all the pieces of the bloody jigsaw puzzle together—despite the fact someone doesn’t want him to complete the picture. 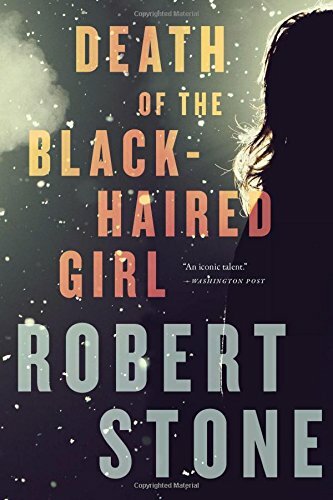 Mr. Stone is a master storyteller whose keen observations bring the reader to some very unfriendly and dark places. A thought provoking book, Death of the Black Haired Girl moves with compulsive momentum, pulling you in from the very first page. Totally gripping.